The solution is to tell Java to use more memory when loading the program. How this is done depends on which version of the program you are using. This will have the format: -Xms64M -Xmx256M, where the -Xmx and -Xms commands determine the maximum and starting amount of memory that java is provided (the M after each number specifies that it is in megabytes). You can now increase the -Xmx option to something larger. 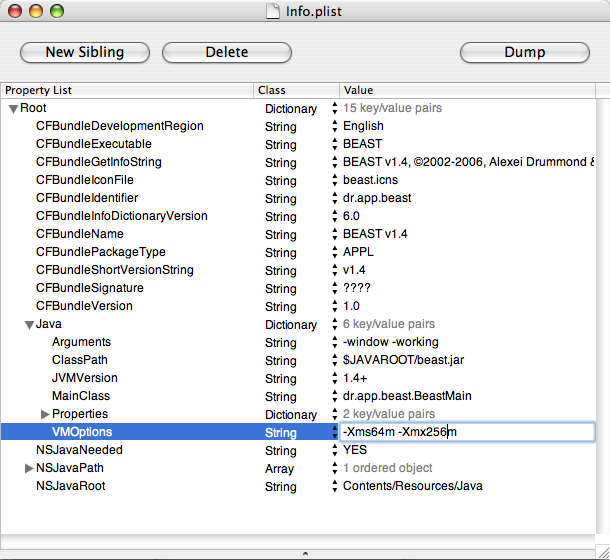 Then save the “info.plist” file, close the folders and try running the program again. Note: if you don’t have the ‘Property List Editor’ installed, you can load the ‘info.plist’ into a text editor – find the string that looks like the one above and edit it. This technique can also be used to increase the memory for the other BEAST-related programs such as LogCombiner, TreeAnnotator and Tracer. 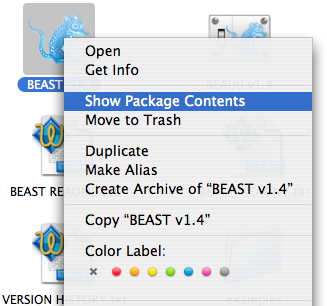 If you are using the command-line version of BEAST on Mac OS X, then see the next section. The -Xmx and -Xms commands determine the maximum and starting amount of memory that java is provided (the M after each number specifies that it is in megabytes). Try increasing the -Xmx number to something larger. In many cases, BEAST and the other programs will be run by calling the executable shell scripts in the BEAST.v1.4/bin directory. If you edit these, you will see a java command similar to the above and you can adjust the memory usage as required.